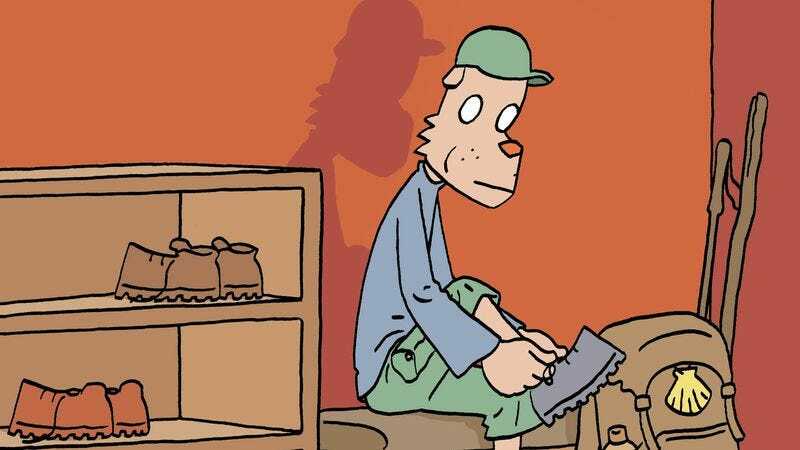 Norwegian cartoonist Jason is internationally renowned for his minimalist, deadpan comics starring anthropomorphized animal characters, but he’s doing something different with his latest Fantagraphics graphic novel. His visual style isn’t changing, but the subject matter is—for the first time ever, Jason is bringing his own life to the page with the autobiographical On The Camino. This travelogue recounts the highs and lows of his experience walking the 500-mile Camino de Santiago in Spain for his 50th birthday, and it’s an immersive exploration of the pilgrimage route that splits time between Jason on his own and interacting with other travelers along the way. Jason has to come out of his shell in order to interact with his fellow travelers, and this exclusive preview of On The Camino highlights his isolation and anxiety as he begins his walk. Most of the story is told using a four-panel grid, which sets a steady pace that pulls the reader deeper into Jason’s journey as he moves further along the camino. When he does break from that structure, like in the final splash page of this preview, it’s to give the visual greater impact. He captures the importance of his first steps on the camino by devoting an entire page to this single moment, and it’s one of the few instances where he deviates from the grid. Readers can join Jason on his trek when On The Camino goes on sale May 31, but in the meanwhile, they can witness the opening moments in this excerpt.